WHAT WILL AMERICA'S ICONIC PARKS LOOK LIKE IN 2050? Americans love the national parks. According to a 2016 survey, 77 percent of American voters feel the country benefits either “a great deal” or “a fair amount” from the parks, with similar responses from Democrats (81 percent) and Republicans (75 percent). Whether that’s because of fond memories of camping in Yellowstone, hiking in the Grand Canyon, or rock climbing in Joshua Tree, Americans across the political spectrum value these natural landscapes—even while it feels increasingly difficult for us to agree about anything else. But recent events may give us pause about their future. Between the proposed increase in park entry fees and Interior Secretary Ryan Zinke’s recommendation to increase oil drilling underneath certain monuments, the parks could become very different from the places we know today. The vulnerability of these beloved landscapes inspired independent artist Hannah Rothstein to spotlight an issue that is more divisive: climate change. 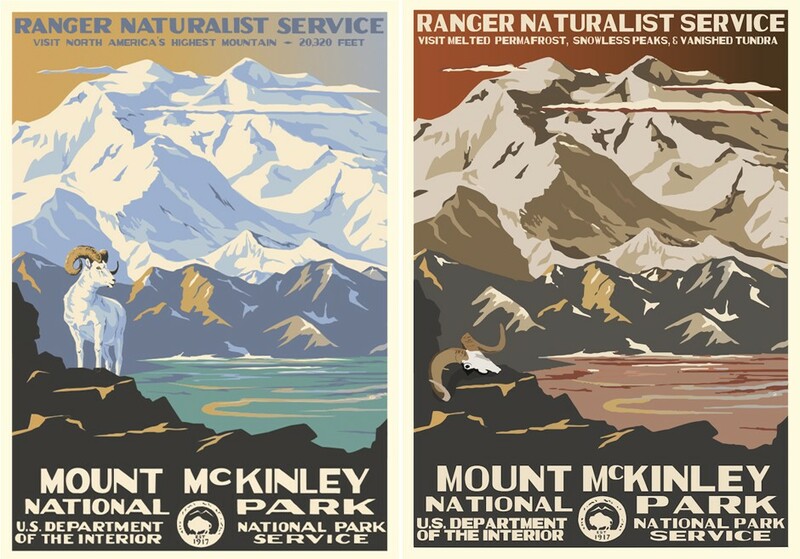 In her series National Parks 2050, she reimagines seven historic posters, originally designed by the Works Progress Administration (WPA), to show what the parks might look like in 2050 after being damaged by climate change. 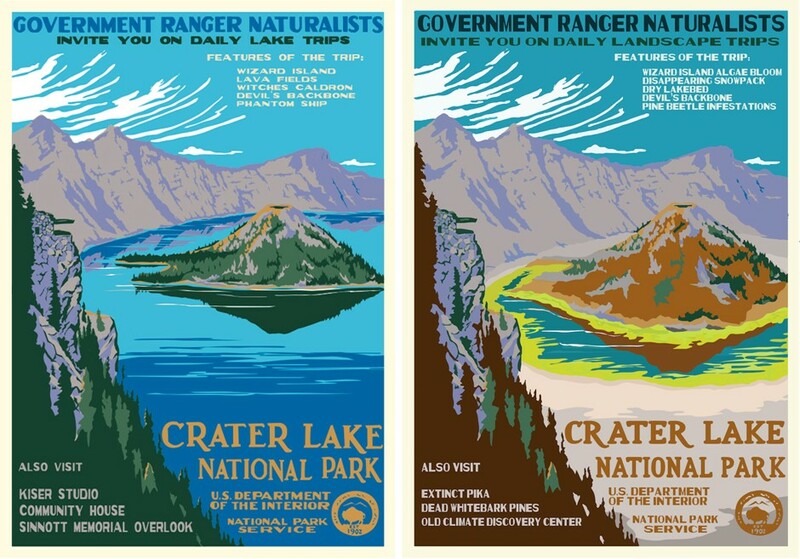 Between 1938 and 1941, the WPA designed posters for national parks across the U.S. You know the ones—brightly colored, block-lettered scenes of places like Grand Teton and Yosemite. The series was just one of the projects that came out of the WPA, which was established by Franklin D. Roosevelt as part of his New Deal initiative to create jobs during the Depression. 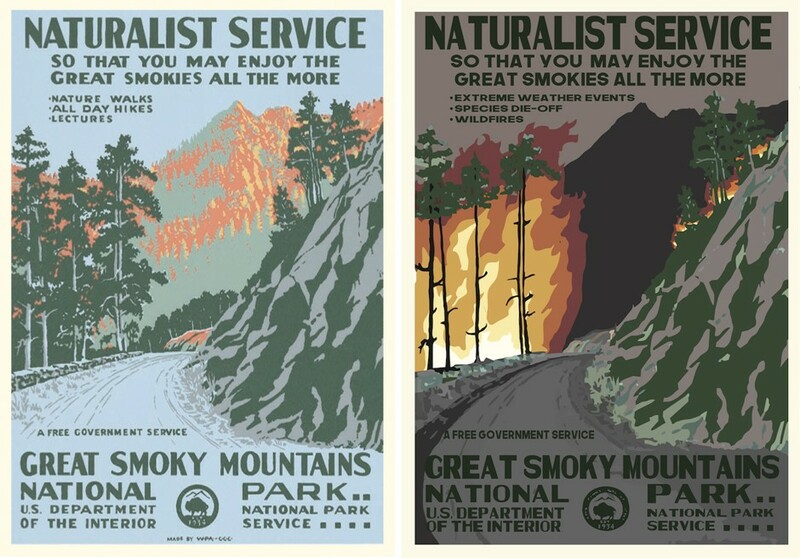 This was also the era when the national parks were consolidated into the system we now know, and the posters played a promotional role to encourage Americans to visit them. 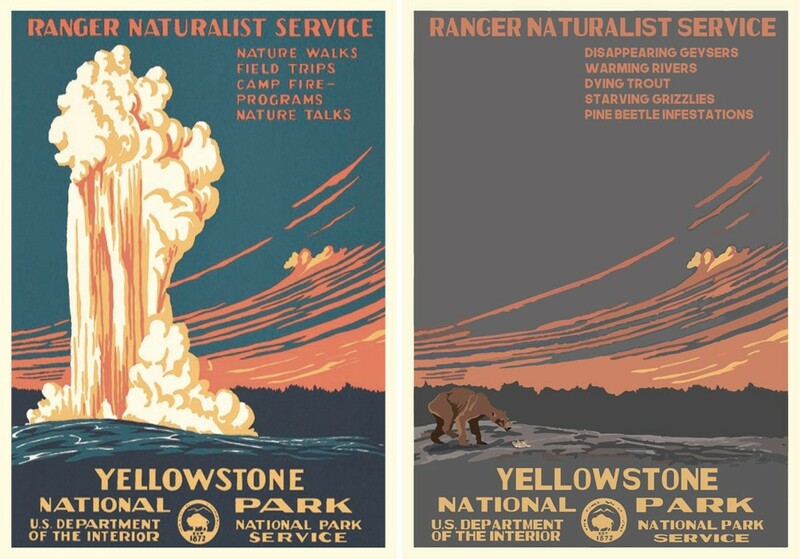 By the time World War II put an end to the project, only 14 parks had responded to the WPA’s offer to make posters, but these have since become iconic. Today, Rothstein’s reimagined versions give us the chance to reflect on how the parks might look in the future. “[The posters] are representative of a time during which we remember America being very great, and I wanted to take that symbol of greatness and examine what we are likely doing to it through our current actions,” Rothstein said. Rothstein said it was important to her that the posters correctly represent the science of climate change. After reading government websites, academic studies, and news sources, she strove to accurately depict how each of these landscapes might actually change between now and 2050. For example, in her rendition of Great Smoky Mountains National Park in Tennessee and North Carolina (pictured above), trees are set ablaze as the result of the drought and rising temperatures that climate scientists believe will come to plague the Southeast. Back West, in Yellowstone—the world’s first national park—small water basins are already drying up, and the decrease in rain and snowmelt threatens wildlife. So in Rothstein’s poster, Old Faithful, the geyser named for its frequent eruptions, has dried up, and an emaciated grizzly bear wanders the barren land. Infrequent rainfall, snowmelt, and shorter winters are threats to Oregon’s Crater Lake, too. The lake is currently the deepest in the country, but in Rothstein’s depiction, it is all but gone. The trees around the lake will also become brown and dry, she says, unless we find a way to stop the bark-beetle epidemic, which has already gnawed away at some 46 million of the country’s 850 million acres of forest land. The neon green rings around Wizard Island, the land mass in the middle of the lake, are the result of an algae bloom, which could occur as temperatures rise. Rising temperatures will be particularly devastating in Alaska, which is home to Denali National Park—the highest peak in North America. The original WPA poster is blue with permafrost, the layer of ice and soil that currently stays frozen year-round. But certain parts of Alaska are already becoming swamp-like as the permafrost layer melts—a phenomenon that is expected to get drastically worse over the next century. This is the landscape that Rothstein depicts, rendering Denali a reddish brown, devoid of the wildlife that once roamed its frosty peaks. Rothstein released the posters last April, in time for the March for Science in Washington, D.C. “I have one version for download as a protest poster that people can take with them to marches, which I’ve seen [people download] every time there’s a march,” she said. People have been sending them in postcard form to their senators and representatives, too, she said. Over the past year, their resonance has only grown stronger. 2017 was the costliest year on record for natural disasters in the U.S., according to the National Oceanic and Atmospheric Administration. California experienced the most destructive fire season in the state’s history, Hurricane Harvey broke a rainfall record in Houston, and in the wake of Hurricane Maria, Puerto Rico is has yet to make it out of the longest blackout in U.S. history. Meanwhile, the Trump administration decided to pull out of the Paris climate accord and shrank the size of Bears Ears and Grand Staircase national monuments. Alastair Boone is an editorial fellow at CityLab.